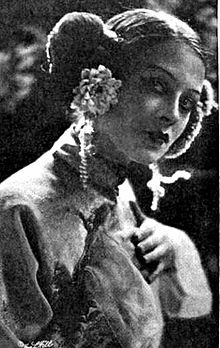 Lenore Ulric (born Lenore Ulrich; July 21, 1892 – December 30, 1970) was a star of the Broadway stage and Hollywood films of the silent-film and early sound era. Discovered in 1913 by theater director David Belasco, who would go on to manage her stage career, she was noted for portraying fiery, hot-blooded women of the typical "femme fatale". Her father, Franz Xavier Ulrich, was a United States Army hospital steward. He reportedly named his daughter Lenore due to his fondness for the Edgar Allan Poe poem, "The Raven". She later dropped the "h" from her surname. As a schoolgirl, Lenore obtained a job with a stock company in Milwaukee, Wisconsin. She played with stock companies in Grand Rapids, Michigan and Chicago, Illinois. She worked briefly as a film actress for Essanay Studios and joined another stock company in Schenectady, New York. She found work in The First Man (1911), A Polished Burglar (1911), Kilmeny (1915), and The Better Woman (1915). She specialized in playing sultry, impassioned women. In 1915, she went to work for Pallas Pictures starring in several silent pictures, such as Frozen Justice and The Intrigue, that survive today at the Library of Congress. Success goes to women who are interesting. Nothing else matters. I don't believe even beauty matters. After seeing Ulric in some of her plays, British producer Charles Cochrane cabled David Belasco with an "urgent request" that he be granted the privilege of presenting Ulric at one of his London playhouses. During that time, however, Belasco had been writing a new version of Camille for Ulric to star in. According to one critic, "Miss Ulric's youth fits her peculiarly for the part, while her undisputed genius as an emotional actress justifies the prediction that she would be the greatest Camille who has ever been seen upon the stage." All of us who were with him depended upon him so much that we'd just flounder around and say, "What do I do now?" He was a good soldier, a hard worker, and a great director. During the height of her stage career, Ulric was considered one of the American theater's "great stars." She was noted for portraying fiery, hot-blooded women of the typical "femme fatale." According to the New York Times, theater-goers would go to her plays just to see her, while the play in which she appeared was secondary. Ulric's "name in white lights blazing on the playhouse marquee was always more compelling" than the play itself. 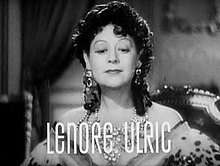 Lenore came to Hollywood in 1929 and appeared in Frozen Justice and South Sea Rose. She signed with Fox Film Corporation to make several films with an approximate salary of $650,000. Frozen Justice was directed by Allan Dwan. Some of the scenes were filmed in Alaska. She was successful in a supporting role in Camille, starring Greta Garbo. Ulric returned to Broadway in 1940, acting in The Fifth Column by Ernest Hemingway and again in 1947, in a revival of Antony and Cleopatra. I don't think I'm comfortable to live with. I have a temper. I'm difficult. I'm too quick and too impulsive. And men have a right to be comfortable. She died of heart failure in Rockland State Hospital, Orangeburg, New York on December 30, 1970, aged 78. Wikimedia Commons has media related to Lenore Ulric. This page was last edited on 19 February 2019, at 00:13 (UTC).